Georgia Bio has honored Abel De La Rosa, PhD, chief scientific officer of Drug Innovation Ventures at Emory (DRIVE) and the Emory Institute for Drug Development (EIDD) with a 2017 Community Award. Each year Georgia Bio recognizes individuals, companies and organizations for significant contributions to Georgia’s life sciences industry with its Georgia Bio Community Awards. The recipients were honored at the 19th Annual Awards Dinner on January 26. DRIVE and EIDD are focused on the discovery and development of antiviral drugs for the treatment of viral diseases of unmet medical need and global concern. Prior to joining Emory, De La Rosa was senior vice president of business development and scientific affairs for Pharmasset. From 2002 until its acquisition by Gilead Sciences (Nasdaq: GILD) for $11 billion in 2012, he was responsible for licensing, strategic transactions and alliance management of collaborations and partnerships with pharmaceutical companies and universities. 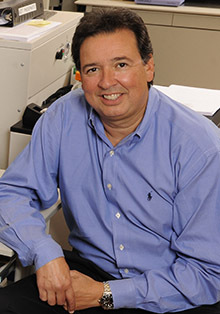 De La Rosa is being honored for outstanding achievements in the life sciences industry, including his leadership at Pharmasset and current role at DRIVE, along with continued support of Georgia Bio activities. DRIVE is a not-for-profit company wholly owned by Emory, but with the independence to run like a biotechnology company. DRIVE applies focus and industry development expertise to efficiently translate discoveries to address viruses of global concern. DRIVE has an internal program working on the discovery and development of nucleoside/nucleotide analogues against respiratory syncytial virus, chikungunya virus, dengue virus and Zika virus. The EIDD was founded to provide the multidisciplinary capabilities required to effectively advance cutting-edge drug discovery and development programs at the preclinical stage. The EIDD is housed in 12,000 sq. ft. state-of-the art, fully equipped laboratory and office space that was designed to support dedicated teams focused on medicinal and process chemistry, virology and molecular biology, bioanalytical chemistry, drug metabolism and pharmacokinetics. EIDD currently has a Department of Defense contract to develop nucleoside/nucleotide analogues against Venezuelan equine encephalitis virus, a biodefense threat. Learn more about the Georgia Bio Awards at www.gabio.org/awards.